4-Word Review: Psychic is a phoney. Myra Savage (Kim Stanley) is an emotionally unbalanced woman and failed psychic who comes up with an idea that she hopes will revive her career. The plan is for her husband Billy (Richard Attenborough) to kidnap Amanda Clayton (Judith Donner) who is the young daughter of a rich businessman. They will then place her at a strategic location and hold a public séance at which time Myra will ‘miraculously’ predict her whereabouts. This will then, they hope, make her famous and world renowned, but of course things don’t work out as expected. This is indeed a unique and unusual film that taps into some rare qualities. First and foremost is the black and white cinematography. Every camera shot and angle has a certain evocative flair that is well captured and vivid. The on-location shots pick up just the right amount of ambiance and lighting with each setting. The music score is great and helps create excellent tension. You also will love the little girl that they kidnap. She is adorable without it being forced. Her matter-of-fact sensibilities are a great contrast to Attenborough and Stanley whose characters are child-like and pathetic. Yet the film doesn’t completely work. The story is handled in a plodding and methodical way without any twists or surprises. There is very little action, some definite slow spots and the conclusion is limp. If you watch it for the performances then you will be more intrigued. Stage actress Stanley gives a rare film appearance here. It is easy to see why she took the role even though she was known to dislike doing films. The takes are long and give almost unlimited possibilities in creating a character, which is what all stage actors enjoy. She does well and at times may remind one of another legendary actress Geraldine Page who would have also been perfect for the part. Attenborough proves almost her equal. His expressions of shock and worry are memorable. The interplay between the two is fun especially towards the end when this otherwise passive man stands up to the domineering woman. Overall there are some unique moments, but it is just not suspenseful enough and results in being only slightly above average. This entry was posted in 60's Movies, Black & White, British Movies, Drama, Foreign Films, Kidnapping Movies, Moody/Stylish, Movies Based on Novels, Psychological and tagged 60's Movies, Black & White, British Movies, Drama, Foreign Films, Moody/Stylish, Movies Based on Novels, psychological. Bookmark the permalink. A dreary afternoon. 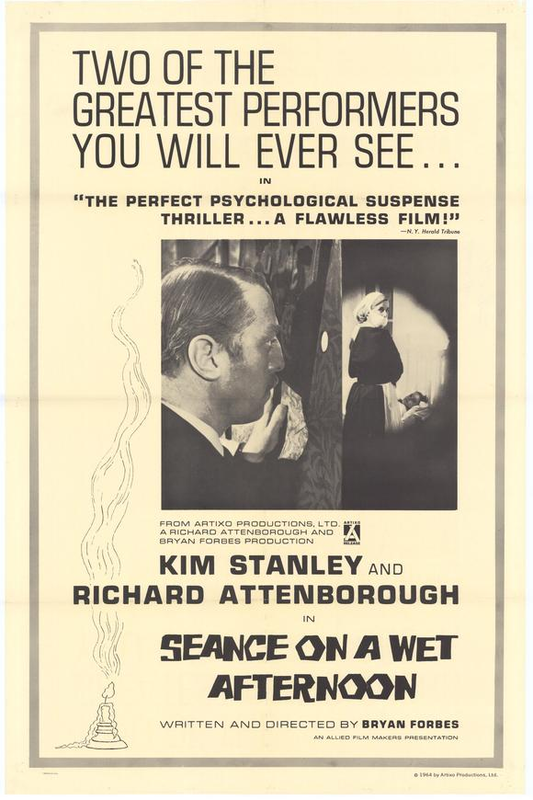 Plodding melodrama which overuses its score, but Stanley is worth watching.